Infamous street artist Bansky is back, this time opening the Walled-Off Hotel in Bethlehem. Infamous street artist Banksy is back with a new project: The Walled-Off hotel in the historic city of Bethlehem. The name of the hotel is no coincidence: it's located right next to the separation wall that Israel put up around the city. 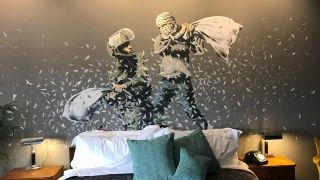 Lodgings, art gallery and protest all rolled into one, Banksy's latest project was revealed to the media on Friday, with the aim of attracting jobs and tourists to the town. Travel to Bethlehem has been ravaged by tight Israeli controls, but Bansky has cleverly located his new project in an area just outside the town and still under Israeli control, meaning it is legal to visit. A genuine business venture, the Walled-Off hotel boasts nine rooms and one suite – only one of which has a view – and will be open for bookings on its website later this month. Who knows how the project will pan out, but if the success of Banksy's recent Dismaland project is anything to go by, we're sure there'll be no shortage of bookings. Want to see more? Channel 4's Krishnan Guru-Murthy has uploaded a video to his Facebook page of his tour of Banksy's new hotel.